Hi all. Great work. I've played right through to The Stand - Countdown, and the win condition is to bring Zeratul and Artanis to the temple thingy, but there is no Artanis in the mission. He doesn't appear in the opening cutscene or anywhere on the map. I tried editing the map, inserting an Artanis asset (Artanis as Scout) and played through, took them to the temple. Zeratul does his thing just fine, but Artanis just sits at the target zone and no luck. Any advice? Don't play maps from previous versions? 7.0 episodes 4-6 are not released. Hello there, and thanks again for the fantastic mod! I've played it a couple of years ago and really loved it, and am kinda excited to try out this new version. I see that the first 3 campaigns are available to be played right now. My question is, will the upcoming update with the Brood War campaigns add any significant features, or just balance changes \ fixes? I'm trying to determine whether I should play the first 3 campaigns now and then pick up the other 3 whenever they're available without missing out on any new features. Thanks again, and keep up the amazing work! It's really appreciated. Well, I don't know about you, but I am waiting for the full release. Omega usually throws in a surprise or 2 with his new releases, as he did with Enslavers Redux. The full release will also include Enslavers Redux, Stukov Series, and looming campaigns, as well. There will also be bugs fixed too, such as double Kerrigan and science vessels shielding enemy units. Ok, if what the patch notes say is correct, then blizz just fixed the "save failed" bug. Can someone check if this also applies to SCMR? Hi, I'm enjoying Mass Recall but I have one suggestion: If it's possible, could ye add an option to turn off the custom soundtrack or could ye set it to the music slider? At present, the only way to turn it off is to turn off all sound effects in the game. This is a request that was submitted ever since the Heart of the swarm version was released. To remove all non SC1 music and sounds. So far the only person that actually said that they might give the option to do it was OmegaWeaponX85 and it was before 7.0 was released, but it said it might come at a later date. Personally I can't stand most of the custom music and sounds. One of the worst offenders was the secret Zeratul Mission, where the constant BEEP BOOPS interrupt one of the most interesting cutscenes. how can i test 4-6 campaign? or when we get access to them? I played the first three chapters of 7.0 and they were amazing and flawless. I know y'all are working on the other chapters, but does that make the other 3 chapters from Brood Wars unplayable? I noticed a drop in quality in chapter 4, and I was even unable to finish the "Countdown" mission due to Artanis not even being on the map. I tried to move on the the chapter 5 but noticed each mission was not functioning proper at all. The first mission had no council room or cinematic. Raynor's Battlecruiser was present and I was instantly attacked by siege tanks. Maybe the reason the maps were nonfunctioning were because you used the maps from prior versions? Brood War episodes for 7.0 are not even released, and the ones you used must've been for 6.2.1 or even earlier - of course they are not going to work correctly with 7.0. The only thing I can say is wait for them - AFAIK, the BW episodes are currently ongoing playtesting on Brutal (though there were 3 and a half months since we heard anything from the team after 7.0 was released). If you want to play BW episodes now, you can download files from 6.2.1, but I'm not gonna vouch for the stability. Just move everything SCMR related to some other folder beforehand, you have seen yourself what version incompatibility can do. Add this to your mod folder with the other SCMR files, replacing the dummy cinematic file. If you want to disable the SC2 flashback cinematic, disable the New Gettysburg City Tileset, in Options --> Interface. It doesn't play when you're on the space platform version. For the rest of the vanilla "Cinematics", you need to enable them in Options --> Gameplay, in the SCMR menu. "Interludes" are the Remastered story slideshows during the old black with text briefing screens. You'd cycle those with the spacebar, if enabled. Just copy the Mods folder (not just contents, the folder itself) from the archive to your Starcraft II folder. 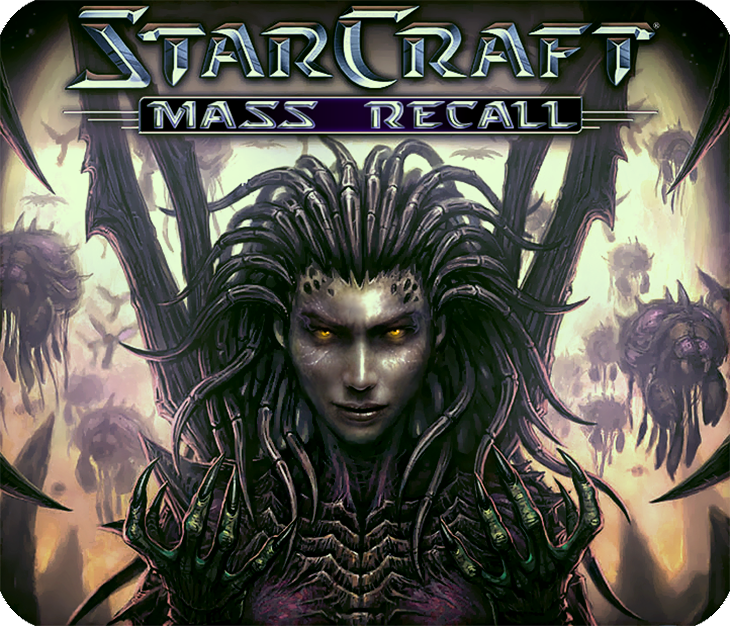 Create Maps folder in main Starctaft II folder and put Starcraft Mass Recall from archive there, then test-run the SCMR Campaign Launcher. You can then make a save and move said save to your BNet profile by using the "open in folder" option in the save menu, but AFAIK playing in profile causes the "Save Failed" error to happen once you load a different map. Also, be sure to replace the "dummy" SCMRcinematics from the archive with one from "Cinematics Pack" OR replace the Launcher with a hotfixed version (NOT BOTH), otherwise there wil be problems loading certain missions from launcher. Edmund Duke : Siege mode and his ability take same hotkey E so I can't siege mode him by keyboard but manually. Brutal : Too many mutalisks. whereas Original version terran is not capable of dealing with mass mutalisks in early games. They don't make any sense - I couldn't proceed but keep fencing. I think it'd be better choice reducing number of mutalisks, increasing hydras & zerglings for compensation. Hotkey issue : I can't customize hotkey as I want to because for some reason hotkeys are weaved with high complexity. And even more I can't modify Edmund duke's ability hotkey because he is not listed on hotkey list. When I tried to alter siegemode E to D(duplicated), then somewhatreason Wraith(T), Escapes and other about 27 hotkeys were delisted. And I couldn't allocate keys to them all since when I defined one, it caused another undefined. ... It's awfully annoying that made me to give up playing game anymore. Command center : when canceled while constructing, displays commandcenter_death, not general building death. The way I was able to beat the muta ball was getting rid of missile turrets so that I have more space to cluster bunkers together and fill em with marines and stim away. Doesn't work properly for me and I'm very sad. 1) Saves doesn't work at all, after saving the pop-up which usually says 'save successfully' is labeled 'fail'. 2) After the Backwater Station mission, after leaving the game I have no access to any missions unless I play them again from the start. 3) Upon 'unlock all missions', and trying to start any - it's stated 'failed to load map' and I'm kicked out to the B-net account menu. Any help will be appreciated to fix that issue. 1) Blizzard bug. Why they STILL don't try to fix this, i don't know. 2) Must be a problem with bank data. Did you use the rewind during the missions? It screws up with bank data and prevents it from properly updating. Also, try starting the map then returning back to launcher - might help, but I'm not sure. 3) Screenshot of your Maps and Starcraft Mass Recall folders pls, possibly maps are misplaced? Maps only fail to load from the launcher, not previous map?